Meg White Sculpture Studio Inc.
Meg White grew up in the suburban neighborhood of Silver Hills in New Albany, Indiana. Meg is a self-taught sculptor who discovered the three dimensional process thru paper sculpture. She was a free-lance commercial artist from 1987 thru 1991; using her paper sculpture as the primary medium. Her clients included Sesame Street, General Electric, Chi-Chi's and Gibson Cards. In 1991, Meg discovered stone carving at Don Lawler's studio and began to create wildlife and figurative works on a full-time basis. 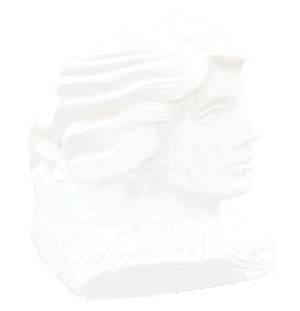 Meg now produces limited edition bronzes as well as small and monumental-scale works in stone.